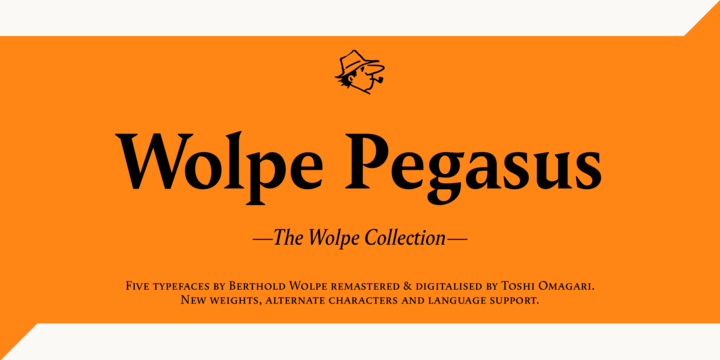 Wolpe Pegasus is a distinctive serif text typeface created by Berthold Wolpe, digitized by Toshi Omagari and published by Monotype. Available in 2 styles (Regular, Italic) each with 2 weights (Regular, Bold), Wolpe Pegasus is a super precise revival of the 1930 Pegasus original making it great for books, journals and a variety of online content. Fly with Pegasus! A font description published on Wednesday, November 1st, 2017 in Berthold Wolpe, Fonts, Serif, Toshi Omagari by Andrei that has 1,512 views.